It’s time, Cleveland Browns fans. The regular season is about to begin, and we’re once again about to find out if the optimism we feel every summer regardless of how the previous year went actually pays off. 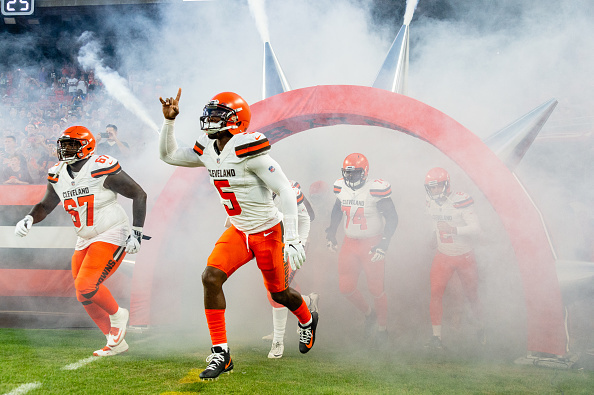 The hype leading up to this Browns season has been unlike anything I’ve ever seen, especially when you consider the team is fresh off an 0-16 season. With that said, it’s time I toss my hat in the ring and throw out a few predictions for the year ahead. What will be one of the biggest areas of strength for the Browns? I’m going running back on this one. Carlos Hyde looked good in his brief preseason action, while Duke Johnson has proven to be one of the most reliable (and only) playmakers in Cleveland. Rookie Nick Chubb rounds it out and provides the Browns with a bevy of weapons on the ground. Now we just need to hope Hue Jackson doesn’t spend another season ditching the running game as soon as the Browns fall behind 3-0 in the first quarter. An honorable mention here is the defensive front-seven, but questionable cuts and Mychal Kendricks’ even more questionable financial choices have altered what was once an area of depth. What position will be Cleveland’s biggest weakness? Well, the team just made what feels like it’s one-hundredth alteration to the offensive line, so that’s my bet. Something about starting the undrafted Desmond Harrison last minute doesn’t really wreak of stability. If this move backfires, the Browns could spend all season mixing up their o-line. I’m sure the quarterbacks are thrilled. How long will it be before Baker Mayfield is starting? The Browns have a plan at quarterback! For the first time ever! How exciting! It won’t matter. This is Cleveland we’re talking about, a team which has only started the same QB for an entire 16-game season just once since 1999. Whether it be via injury or too many losses, Mayfield is making his debut this year. It’s about as safe a bet as you can make with this team. As for when, put me down for Week 9 against the Kansas City Chiefs, if only because GM John Dorsey will want to try and show his old team he can still draft well. Will Jackson survive this season? If I had to bet, I’d say no. However, owner Jimmy Haslam will try as hard as he can to avoid a midseason firing. He’s still convinced he made the right hire despite Jackson being one Jamie Meder blocked field goal away from boasting an 0-32 record in Cleveland. That said, we know Jackson, and we know he believes none of the losing is his fault. The fact all his excuses are gone, though, means Haslam will finally see the light. I’ll take a guess and say Jackson gets fired after the Week 12 game against the Cincinnati Bengals. A divisional loss after a bye week? That oughta do it. Alright, I’ve got a word count to keep, so let’s jump into the lightning round. Who will be the 2018 team MVP? Myles Garrett, who’s as lovable as he is terrifying. How many times will the Browns defense forget the position of tight end exists? At least six times per game. You’re going to hate it. How often will Jabrill Peppers be in the same county as the game being played? Peppers is back at his natural position of strong safety, but I still somehow expect him to be lined up in Ashtabula for a minimum of four plays per game. How long before the first fan starts clamoring for Mayfield to start? This will happen immediately after Tyrod Taylor’s first incomplete pass of the season. You’ve been warned. Will Dez Bryant be a Brown this year? How many times will Jackson blame someone else for a loss? How many losses will the Browns have? Because that will answer this question, too. Which is a great transition to my final prediction, the Browns’ record for the upcoming season. If you’ve listened to my podcast, you know I’ve tossed 2-14 around since April. I hate flip-flopping, but the season hasn’t started yet, so screw it. Give me 5-11, with the season ending on a three-game winning streak so we’re ready for another round of offseason hype. Welcome back, Browns football. Maybe don’t crush our souls this time. Yes he is. No more blaming a bad roster. No more calling out the inept front office. I’d like to think he realizes this, but his only instinct when this team loses is to explain why it’s not his fault. The second he starts deflecting should be when Haslam starts getting his backup plans in order.